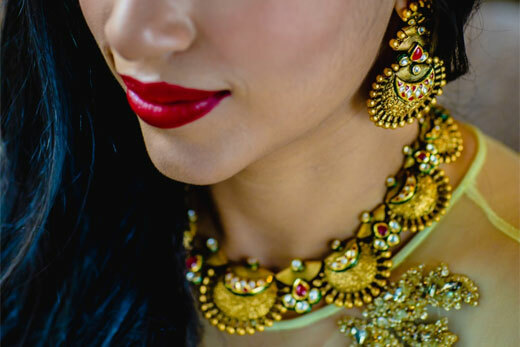 Seven fan like motifs flair around the neck for Wedding Sutra bride Mekhla as we pair the enticing Azva handcrafted gold necklace with earrings that complement. Exquisite layers of fabric in summery shades of yellow and dull gold embroidery encapsulates the aspirations of the modern Indian bride. 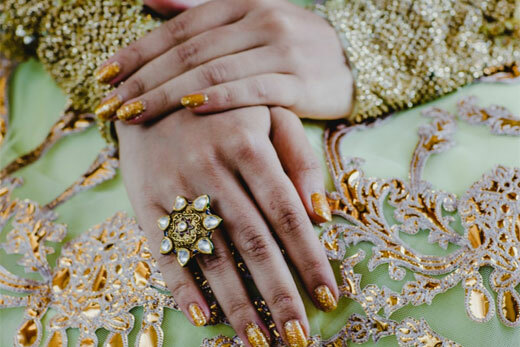 The versatile gold jewellery used is the unparalleled star at the bridal show. Dark eyes and distinct brows create definition as the long earrings accentuated with fan motif and a kundan set stud frames her face. A handcrafted gold ring with radiating petals of white kundan set stone finish the bridal makeover with a bright red on the lips to play up the drama.